2008 Chevrolet Corvette Z06 COUPE 6 SPD,CAM,HEADERS,C/A INTAKE,BLK WHLS,25K! Mint C6 corvette Z51 upgraded 6 speed PAYMENTS WELCOME! 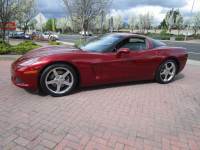 ...Clean 2005 C-6 Corvette Silver with Black interior. Always garaged Well taken care of runs great.